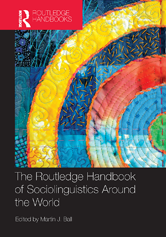 Drawing on examples from a wide range of languages and social setting, The Routledge Handbook of Sociolinguistics Around the World is the first single-volume collection surveying current and recent research trends in international sociolinguistics. With over 30 chapters written by leading authorities in the region concerned, all continents and their respective regions are covered. The book will serve as an important tool to help widen the perspective on sociolinguistics to readers of English. Divided into sections covering: The Americas, Asia, Australasia, Africa and the Middle East, and Europe , the book provides readers with a solid, up-to-date appreciation of the interdisciplinary nature of the field of sociolinguistics in each area. It clearly explains the patterns and systematicity that underlie language variation in use, as well as the ways in which alternations between different language varieties mark personal style, social power and national identity. The Routledge Handbook of Sociolinguistics around the World is the ideal resource for all students on undergraduate sociolinguistics courses and researchers involved in the study of language, society and power.